ʻAla ke kai o ka ʻanae. Fragrant is the soup of a big mullet. ‘Anae (ʻamaʻama – mullet) and awa (milk fish) were popular fish raised in Hawaiian walled fishponds. The cultivation of fish took place in Hawaiian agricultural pondfields, as well as in specialized fresh and brackish water fishponds. Just outside Līhuʻe and Nāwiliwili Harbor on the Hulēʻia River, a Scenic Overlook is located just off of Hulemalu Road, about ½-mile from the entrance to the Nāwiliwili small boat harbor. Although you can see the fishpond and the refuge from the road, the area is not open to the public. Small boats, kayaks, jet skis, windsurfers and water-skiers use the river. ʻAlekoko Fishpond is located near the mouth of the Hulēʻia River, in the ahupuaʻa of Niumalu; it was formed by walling off a large bend in the river; the stone-faced, dirt wall is over 900-yards long. The dirt wall is 5-feet above the water level, 4-feet wide on top and the dirt slants out on both sides. The facing wall begins with a single row of stones and then becomes double-thickness as it gets further out into the river and the current. The pond did not just hold fish. In the 1800s, two of the three gaps in the levee were filled in and the pond was used by rice farmers. In the 1940s, after a tidal wave, the wall was repaired by the man who had the lease at the time. He put bags of cement in the weak spots and now longish “rocks” are visible where the bags deteriorated and the cement hardened. Built by the Menehune, it is also known as Menehune Fishpond. 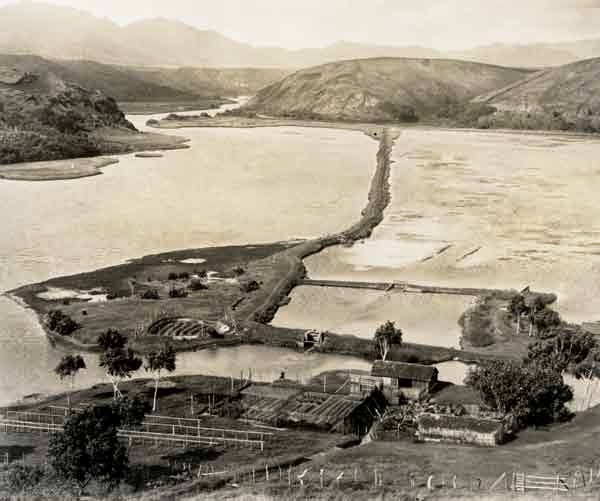 The image shows ʻAlekoko Fishpond (on the right – 1912.) (malamahuleia) In addition, I have included other related images in a folder of like name in the Photos section on my Facebook and Google+ pages.